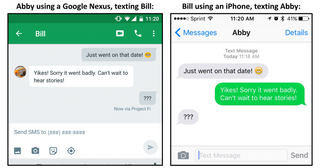 By now you probably know that the emoji you send on an iPhone might not be the emoji that is received on a Nexus. Since emoji are designed differently across platforms, sometimes your text messages might get lost in translation. But how differently might your well-intentioned emoji be displayed? The reality might surprise you. A study by the GroupLens Research team at the University of Minnesota examines the variations between some popular emoji presentations and how they are perceived. The most widely misinterpreted is the “grinning face with smiling eyes” emoji, which—depending on the platform—can range from the rosy-cheeked cherubic face of glee to the anguished clenched-teeth look of constipation. Just seeing the difference in emoji presentations is revelatory in itself. But then it gets even more interesting. GroupLens researchers asked subjects to rate 22 anthropomorphic emoji from five platforms by sentiment, using a scale that ranged from strongly negative (-5) to strongly positive (5). And here’s where you start to see where “grinning face with smiling eyes” goes so very wrong. Apple’s average sentiment ranking was almost -1, while Microsoft, Samsung, LG, and Google all were 3 or above. That wide range between sentiment rankings was named “misconstrual” by the researchers. You can see how the 22 emoji tracked across platforms, with “smiling face with open mouth and tightly closed eyes,” “face with tears of joy,” “sleeping face,” and “loudly crying face” all having their own issues of interpretation. But “grinning face with smiling eyes” is still the clear winner when it came to sending the wrong message. The researchers used this sentiment scale to track the intended and perceived meanings of these same emojis as well. It turns out that if you send an emoji between platforms, there’s an automatic sentiment variance of about 2.04 points. But even within platforms, the average difference is 1.88 points. That’s still quite a bit of misinterpretation. We’re excited about continuing this work along a number of fronts: considering emoji in the context of full text messages, investigating emoji communication breakdowns for people from different national cultures, asking similar questions of non-anthropomorphic emoji, building systems to help test the potential for miscommunication in a new emoji rendering, and so on. More generally, a number of scholars have argued that emoji represent a fundamental shift in language use. As such, fully understanding emoji’s role in human communication will be an important step in developing the next generation of language technologies. It also potentially puts some of the onus on Unicode, the international consortium that governs emoji, to possibly be a bit clearer in its definitions as it adds new characters (which is happening at a faster and faster rate). Platforms also redesign emoji all the time—Apple notably refreshed a few in iOS 8.3—so there is definitely an opportunity to “fix” a widely misinterpreted and potentially relationship-ruining emoji. In the meantime, maybe avoid “grinning face with smiling eyes.” Lest you get the side-eye back.